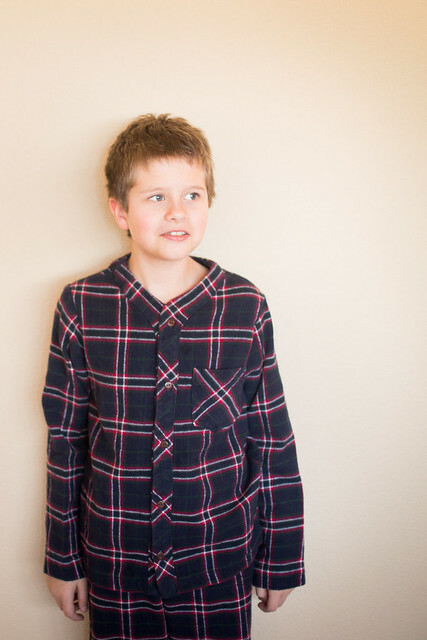 I've been wanting to blog about the Oliver + S Sleepover pajamas ever since I made them almost a month ago. I love taking photos of my kids wearing the things I make... that is, as long as the recipient is eager or at least willing to have his/her photo taken. But, you see, I have this (almost) nine year old boy, who is rather opposed to such frivolous activities as being photographed when there are so many other wonderful things vying for his time and attention. Like reading Calvin and Hobbes comics or building legos. Then, at some point, I realized I do have the outtakes from our Christmas photo attempts, with Jude wearing his new pajamas... happily even. So, yes, these are the Oliver + S Sleepover pajamas. 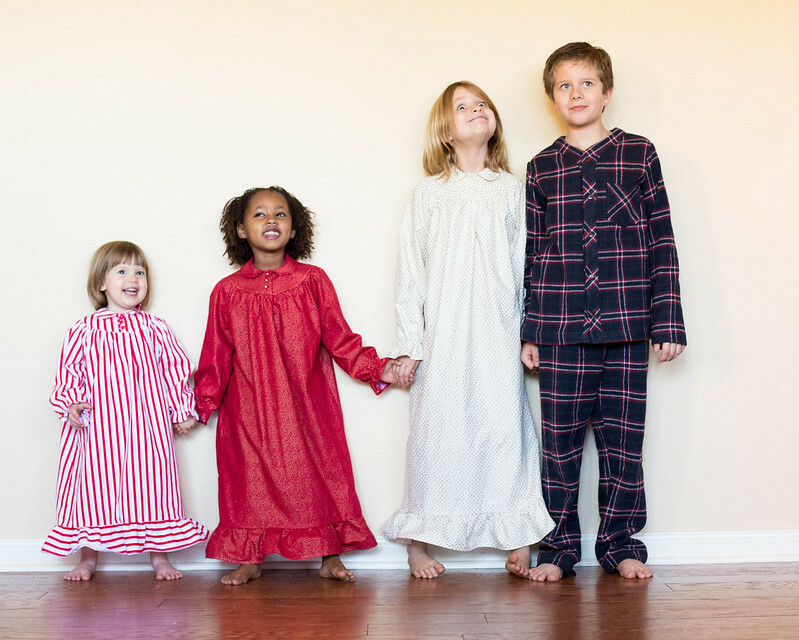 After having my rather disastrous experience with that big box pajama pattern when Jude had grown out of our beloved Bedtime Story pajama pattern, it dawned on me that Oliver + S has another pajama pattern, which goes to size 12. I nabbed it during their 50% off sale back in December. I never intended to sew the sleepover shirt for Jude. I bought the pattern for the pants. But as I was hatching plans for three floor-length nightgowns for the girls, I knew I wanted to make something extra special for Jude, too. I think part of the reason I wasn't initially drawn to this pattern's top was because of the side pockets at the hips. They felt a little young for Jude, maybe. I don't know. I guess I'm kind of particular about which patterns I like for each of my kids' ages. Then I saw this vintage boys pajama pattern and realized it looked similar to the Sleepover pattern, but with a pocket near the top of the shirt. 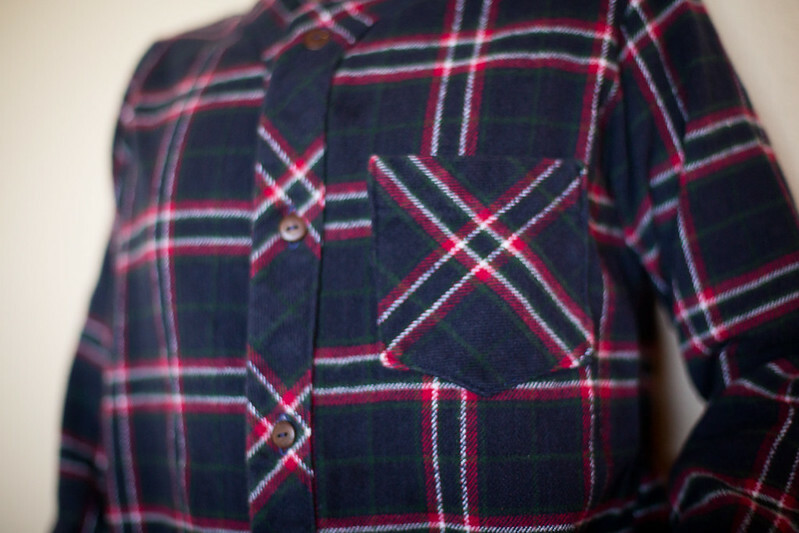 So I drafted a pocket based on one of Jude's other shirts. It was exactly what I was looking for and an easy addition to this pattern. I bought the flannel at Joanns. I was delighted with it. It's some of the best flannel I've ever used - so soft and un-pilly. They had a great selection of apparel flannels, just not in the 4 1/2 yards I needed, four days before Christmas. :) I was happy with this plaid, even though I fell head over heels for a grey flannel herringbone that was absolutely amazing. (I think the fabric selection at Joanns is really improving!). I cut the pocket and facing on the bias and skipped the contrasting cuffs. The buttons are made from coconut shells. I was one short so I had to adjust the button/buttonhole placement to make it work for five instead of six buttons. No problems there. 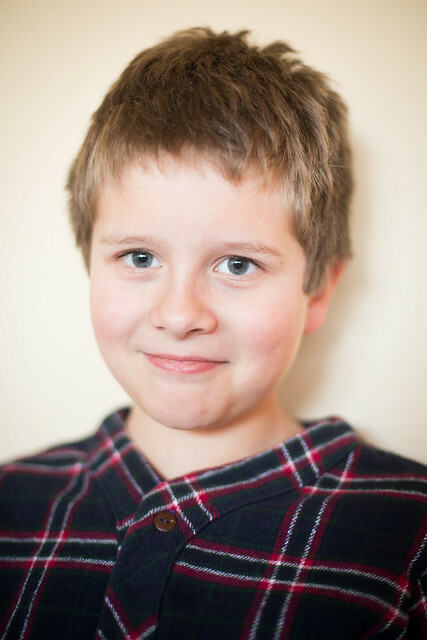 Yesterday, I finally did ask my boy if he might consider letting me take just a few photos of only him in his pajamas. He agreed. Perhaps reluctantly, but agreed he did. And I'm glad I asked, because I was able to get this. He really is the sweetest boy. And while I was typing this, he came to me, freshly showered in his Sleepover pjs and asked if I'd like to take photos of him. See? The sweetest. 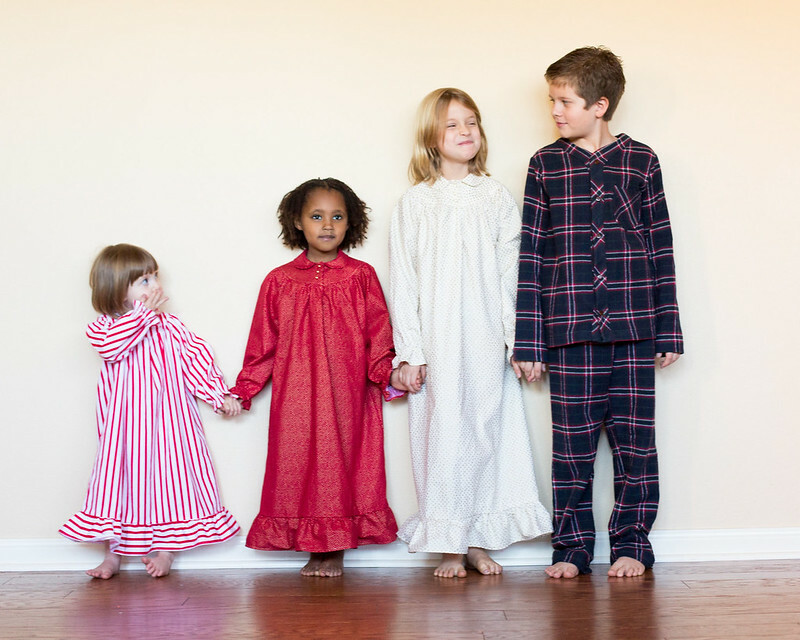 That entire lineup of pajamas is just so sweet! I really like the pocket change you made. I made the pants from this pattern but I failed to check my daughter's measurements and they are so huge on her! I'd like to try the entire outfit again with better sizing. I'll have to look for a sale on flannel or something though, because that's a lot of fabric! You're right - it really does add up, doesn't it? I found this flannel on sale at Joann for 50% off, so it came to something like $5 a yard. Definitely worth it! Truthfully, I haven't been that happy with the indie flannels I've bought. They've faded a lot and pilled, too. I think Joann flannel was actually better quality. (It was the 'apparel flannel'). Those pajamas came out great! I had to size just the top of the Sleepover Pajamas down for my kiddo--of course, I only realized that AFTER I'd cut out the pieces for the top a size too big, but that just means that I can replace the elastic in the pants and let her wear the same pajama bottoms with the larger top next year, too! I wanted to tell you that I got stumped trying to figure out how exactly to sew the placket onto the pajama top, so I Googled it. 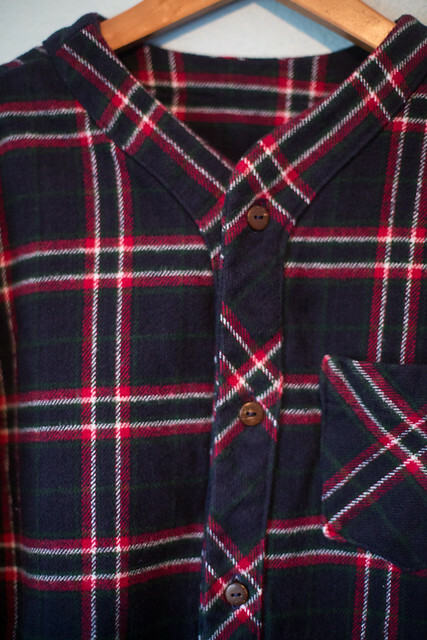 Your close-up photo of the pajama top that shows the placket was exactly what I needed to visualize what I was supposed to do, so thank you! What pattern did you use for the girls nightgowns? They all look adorable! I know my 6 year old daughter and probably my 1 year old daughter would love to wear long nightgowns like these. Oh yes, the girls love these nightgowns. They are Butterick 8247 - a vintage pattern! I hope you're able to find it! It's a good one!